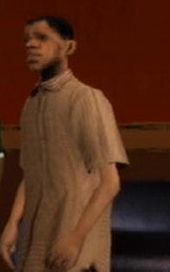 Barry Thorne, better known as Big Bear, is a character in the 3D Universe who appears as a minor character in Grand Theft Auto: San Andreas (set in 1992). He is a long serving member of the Grove Street Families and drug user. He is voiced by Kurt Alexander. Big Bear was presumably born in Ganton and later joined the Grove Street Families. He rose to a prominent position in the gang but after 1987 began to stay away from gang activities as "Streets ain't no place to be when every fool is trying to make a move" (deleted text from Beat Down on B Dup). During this time he began using drugs and was enslaved to his dealer and fellow gangster B Dup, often being made to do degrading chores such as being ordered to clean the toilet in front of Carl Johnson and Ryder. He continues to live with B Dup due to his drug addiction and moves with him into a house in Glen Park, territory controlled by his arch rivals the Ballas. Big Bear, however, continues to resent his ill treatment at the hands of B Dup and, determined to get clean, stands up to B Dup when backed up by Carl and Grove Street Families leader Sweet, punching B Dup before leaving to enter rehab. He is driven away by Sweet in B Dup's car. Game files show two versions of Big Bear, both wearing the same clothing. One shows the Big Bear used in the game and the second shows a much fatter Big Bear. Part of the original Beat Down on B Dup mission involved Carl Johnson driving Big Bear to a rehab centre, where he explained why he began using drugs, stating that the break up of the three families and the attempts of others to rise to power led him to stay at home and then search for adventure in drugs. Big Bear was also to feature in the mission Looking for Big Smoke where he told Carl and Sweet of a Russian Mafia gangster who could inform Carl and Sweet of Big Smoke's location. During this mission he also states that he and B Dup were also cut off from Smoke's 'select circle of cats'. Big Bear shortly after punching B Dup during Beat Down on B Dup. This page was last modified on 9 November 2013, at 23:44.